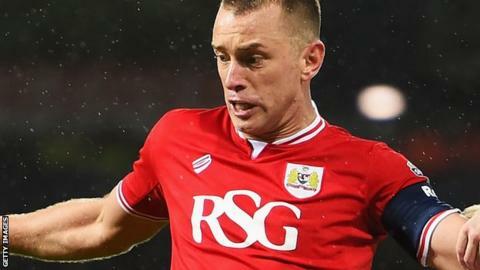 Bristol City forward Aaron Wilbraham's contract with the club has been extended by a further year. The former Milton Keynes Dons and Crystal Palace player, 36, triggered an appearance clause in his previous deal. Wilbraham has featured in every one of the Championship club's matches this season, making 41 appearances in all competitions and scoring seven goals. "I'm absolutely delighted. It's gone really well and I'm feeling fit still," Wilbraham told BBC Radio Bristol. "At the start of this season, there was a discussion that I would not be involved as much as the season before. "As it's turned out, I've played a lot more than people expected." Bristol City are 19th in the table, six points clear of the relegation zone with eight matches remaining.